Khalifa Haftar's order to the self-styled Libyan National Army came as UN chief Antonio Guterres was in Tripoli. Speaking to reporters in Tripoli, Mr Guterres said he was making a "strong appeal to stop... the escalation". "We strongly believe that there is no military solution to the Libya conflict," the governments added. After Gen Haftar's announcement, his forces moved towards the capital from several directions, one of his spokesmen said. There were conflicting reports that Gen Haftar's forces had entered the town of Gharyan, 100km (60 miles) south of Tripoli. 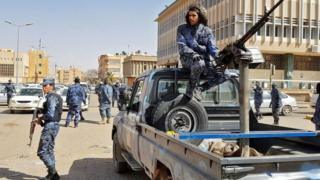 A Gharyan official told AFP that there were "ongoing efforts to avoid a confrontation" between rival fighters in the town.